Cauliflower is by far one of my favorite veggies. Raw, cooked, as rice, you name it, YUM. If I am doing veggies and hummus, you better believe there is going to be cauliflower in the mix. This love comes with quite a few benefits as well for my health. Cauliflower boasts quite a long list of health benefits. First it’s anti-inflammatory. If you are looking to reduce inflammation through your diet, then add this veggie for sure! It’s packed with antioxidants, aids in digestion, helps fight cancer, gives the brain a boost, and so much more. So needless to say, you need more cauliflower in your life! 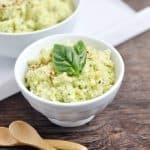 Not everyone is like me and has an extreme love for this veggie, but there are many options for ways to prepare it and this new Creamy Avocado Cauliflower Rice is sure to be a favorite to even the pickiest of eaters when it comes to cauliflower. Ok, I guess I can’t guarantee that, but it’s worth a shot, right? I love cauliflower rice because to be honest, it’s so much quicker to prepare than regular rice. So when you are crunched for time, it’s as easy as popping in the food processor and pulsing a few times. Heat it over the stove and that’s it. Done. 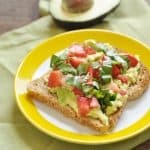 This recipes adds my other favorite thing in the world to the mix: avocado! 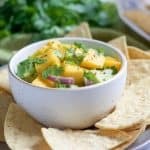 There is nothing like a creamy avocado sauce that again, only takes minutes to prepare. Did I mention I love saving time? Ha. 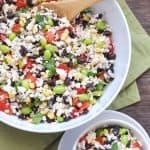 This recipe is the perfect side to accompany dinner or if you are like me, you may eat the whole recipe for dinner…oops! Enjoy! Rinse cauliflower and cut into small florets, place in food processor. In a food processor, pulse for about 30 seconds or until cauliflower is broken down into rice like texture. (Depending on the size of your food processor, you may need to do this in batches). Poor rice into a medium bowl. Add avocado, garlic, basil, olive oil, lemon juice, crushed red pepper, sea salt and black pepper into processor. Process until a smooth, creamy sauce. Heat olive oil over medium heat in a frying pan. Add cauliflower and stir to heat through for about 3-5 minutes. Add avocado cream sauce to cauliflower and stir to combine. Turn heat to low and allow to heat for several more minutes. My food processor has an attachment that I use as well that creates great rice like pieces.